Not God, but Satan, is the ruler of this world. Listen and understand this truth. It will be shocking to know this truth. 1 Juanv / 1 John 5 : 19 Ami Devachim, ani ak'kho sonvsar Noxtteachea tabeant asa: hem-i ami zannonv. / We know that we belong to God, and the whole world is under the power of the evil one. Juanv / John 12 : 31 – 32 - Atam sonvsarachi mon'subi korcho vell; atam hea sonvsaracho odhikari bhair poddtolo. 32 Ani jednam Mhaka zomni velo unch ubhartit, tednam soglleam mon'xank oddun haddtolom". / Now is the time of judgment on this world; now the ruler of this world will be driven out. 32 And when I am lifted up from the earth, I will draw everyone to myself. Juanv / John 16 : 11 - nirnnoia vixim, kiteak hea sonvsarachea odhikareacher khastichem formonn poddlem. / condemnation, because the ruler of this world has been condemned. 2 Korintkarank / 2 Corinthians 4 : 3 – 4 Amchem Xubhvortoman dhamplolem asa zalear, fokot ibadd zaunchê vatter asat tankam tem dhamplolem asa. 4 Mhonngê Krist khoreponnim Devacho rupkar, tôri Tachea mhoimêbhorit Xubhvortomanacho porzôll onbhavarthiank fankona zaunk, hea iugachea devan tanchim monam kudd'ddim keleant. / And even though our gospel is veiled, it is veiled for those who are perishing, 4 in whose case the god of this age has blinded the minds of the unbelievers, so that they may not see the light of the gospel of the glory of Christ, who is the image of God. Lukas / Luke 4 : 5 – 6 - And the devil led him onto a high mountain, and he showed him all the kingdoms of the world in a moment of time, 6 and he said to him: "To you, I will give all this power, and its glory. For they have been handed over to me, and I give them to whomever I wish. / Then he took him up and showed him all the kingdoms of the world in a single instant. 6 The devil said to him, “I shall give to you all this power and their glory; for it has been handed over to me, and I may give it to whomever I wish. 1 Juanv / 1 John 2 : 15 -17 Sonvsaracho ani sonvsarantlea vostuncho môg korum nakat. Sonvsaracho môg kortat tea mon'xam sovem Bapacho môg na: 16 kiteak sonvsarant mellta tem itlench: kuddichi moriadi-bhaili vondovnni, dolleanchi lobhi axa ani girestkaiechi boddai. Hem sogllem Bapa-sun nhoi punn sonvsarantlem upzota. 17 Tôr sonvsar ani tacheô vondovnniô don disam bhitôr nanch zatat. Punn jim konn Devachi khuxi palltat, tim sasnnak togtat. / Do not love the world or the things of the world. If anyone loves the world, the love of the Father is not in him. l 16 For all that is in the world, sensual lust, enticement for the eyes, and a pretentious life, is not from the Father but is from the world. 17 Yet the world and its enticement are passing away. But whoever does the will of God remains forever. 1 Juanv / 1 John 4 : 4 - Supurlea bhurgeamnô, tumi Devachim ani tancher, fottkirea provadiancher, tumi zoit vhelam. Karonn Zo tumchê sovem asa, To sonvsarant asa tachê poros odik bollixtt. / You belong to God, children, and you have conquered them, for the one who is in you is greater than the one who is in the world. 1 Pedru / 1 Peter 5 : 8 - / Be sober and vigilant. Your opponent the devil is prowling around like a roaring lion looking for [someone] to devour. Juanvak Prokasovnni / Revelations 12 : 7 – 9 - Uprant sorgar ek zhuz suru zalem. Mikael aplea dutank gheun aracher zhuzlo. Ar aplea dutank gheun tanchê virudh zhuzlo, 8 punn he harovle ani tankam sorgar anink zago urlo na. 9 Vorixtt arak bhair uddoilo. Toch to adlo sorôp, ak'khea sonvsarak fosoilo to; tachem nanv Devchar ani Soitan; taka ani tachê borabôr tachea dutank khala prithumer xevttile. / Then war broke out in heaven; Michael and his angels battled against the dragon. The dragon and its angels fought back, 8 but they did not prevail and there was no longer any place for them in heaven. 9 The huge dragon, the ancient serpent, who is called the Devil and Satan, who deceived the whole world, was thrown down to earth, and its angels were thrown down with it. 1 Juanv / 1 John 3 : 8 - Jim konn patok kortat, tim devcharachim, karonn devchar orombak thaun patki. Devcharachea kortubancho bhosm korchê khatiruch Devacho Put ailo. / Whoever sins belongs to the devil, because the devil has sinned from the beginning. Indeed, the Son of God was revealed to destroy the works of the devil. Lukas / Luke 10 : 19 - Polleiat, sorop ani vinchu ani dusmanachi soglli podvi pãiam tolla mostunk Hanvem tumkam odhikar dila; kãi-ek tumkam vaitt zait-xem na. / Behold, I have given you the power 'to tread upon serpents' and scorpions and upon the full force of the enemy and nothing will harm you. Mark / Mark 16 : 17 - Bhavarth dhortoleam sovem heo khunna dixtti poddtoleo : Mhojea Nanvan devchar kaddtolim, noveo bhaso uloitolim / These signs will accompany those who believe: in my name they will drive out demons, they will speak new languages. Dhormdutancho Itihas / Acts of Apostles 8 : 7 - Zaitea devchar-boslolea thaun mhelle atme bob marun bhair sortale ani puskoll ar zallim ani thonttim borim zatalim / For unclean spirits, crying out in a loud voice, came out of many possessed people, and many paralyzed and crippled people were cured. Lukas/ Luke 10 : 18 - Ani Tannem tankam sanglem: Viz koso sorgar thaun poddlolo Hanvem Soitanak dekhlo. / Jesus said, “I have observed Satan fall like lightning from the sky. Romkarank / Romans 16 : 20 - Ani xanti dita to Dev Soitanak veginch tumchea pãiam tolla ghalun mostitolo. Jezu Krist amcho Somi tumkam sodanch Aplem bholeponn dakhoum mhonn magtam. / then the God of peace will quickly crush Satan under your feet. The grace of our Lord Jesus be with you. Tobit / Tobit 5 : 4 - Tobias apnna borabor Media vochunk vatt zanno toslo monis sôdunk gelo. Bhair gelo zalear, tachê hujir dut Rafael ubo aslo, to Devacho dut mhonn taka koll'lem na. / Tobiah went out to look for someone who would travel with him to Media, someone who knew the way. He went out and found the angel Raphael standing before him (though he did not know that this was an angel of God). 2 Korintkarank / 2 Corinthians 11 : 14 - Hantum koslench ojap na, kiteak khud Soitan porian tezvont devdutachem sovong gheun dixtti poddta. / And no wonder, for even Satan masquerades as an angel of light. Hebrevank / Hebrew 1 : 14 - Devdut konn tôr? Te soglle atme; te Devachi chakri kortat, ani taronn gheunchim asat tankam adar diunk Dev tankam patthoita. / Are they not all ministering spirits sent to serve, for the sake of those who are to inherit salvation? Matev / Mathew 22 : 29 – 30 Jezun portipallun tankam mhollem: Povitr Pustokanchi, nhoi mhonn Devache podvechi, tumkam vollokh na dekhun tumi chuktat. Karonn, punorjivontponnachea somoiar dadle logn zainant ani bailank logn korun dinant, pun tim sorgar asteam Devachea dutam sarkim zatat. / Jesus said to them in reply, “You are misled because you do not know the scriptures or the power of God. 30 At the resurrection they neither marry nor are given in marriage but are like the angels in heaven. Ezekiel / Ezekiel 28 : 12 – 17 - / Son of man, raise a lament over the king of Tyre, and say to him: Thus says the Lord GOD : You were a seal of perfection, full of wisdom, perfect in beauty. 13 In Eden, the garden of God, you lived; precious stones of every kind were your covering: Carnelian, topaz, and beryl, chrysolite, onyx, and jasper, sapphire, garnet, and emerald. Their mounts and settings were wrought in gold, fashioned for you the day you were created. 14 With a cherub I placed you; I put you on the holy mountain of God, where you walked among fiery stones. 15 Blameless were you in your ways from the day you were created, Until evil was found in you. 16 Your commerce was full of lawlessness, and you sinned. 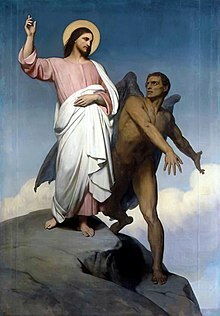 Therefore I banished you from the mountain of God; the cherub drove you out from among the fiery stones. 17 Your heart had grown haughty because of your beauty; You corrupted your wisdom because of your splendor. I cast you to the ground, I made you a spectacle in the sight of kings. Izaias / Isaiah 14 : 12 - Ê Disachea Noketra, ê Fanteachea puta, koso mhonn mollba velo xevtton poddloi tum? Tum raxttrank tujê khal chepun dovortaloi: tôr koso mhonn tuka dhornir xevttun uddoilo? / How you have fallen from the heavens, O Morning Star, son of the dawn! How you have been cut down to the earth, you who conquered nations!